Cross stitch and make your life more peaceful and comfortable! Discover a great variety of free sewing patterns: animals, florals, landscapes and etc., and find your favorite ones. 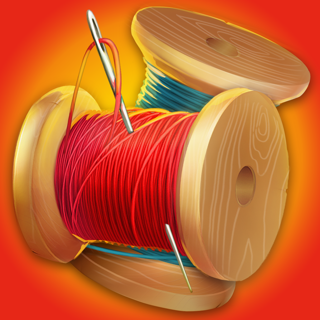 Cross stitch easily, just choose color thread and tap on the canvas to sew a knot. Don’t forget to share your best artworks with family and friends, let everyone see your beautiful pictures. · Sew anywhere, no needle, canvas or color thread needed! · Enjoy numerous themed pictures: animals, florals, landscapes and many others. · New sewing patterns are added daily, so you will never get bored! · Our coloring game automatically saves your progress as you play, so there is no need to start all over again! Create colorful embroidery, relax and relieve stress! I’ve only been playing this app for 2 and 1/2 weeks now but it’s the best cross stitch app I’ve seen so far from the apps store by far and I’ve played a lot of them! Five of them to date. 1) This one responded to what I wanted as far as staying still when I wanted it to so I could color a bunch of the same color which was all together. 2) It knew that I was touching squares to move around the picture to get to where I wanted to get to and not color along the way there. Which can be quite frustrating at best! For sure! 3) One negative thing is that there is no way of mass filling in of spaces of the same colors for instance when a space is all in one color like a portion of sky or whatever. Other apps let you watch an advert for a certain # of minutes of free use of a bucket that lets me fill in an entire area of anything that basically touches with the same color as itself. Very very helpful and ups the enjoyment factor by bunches and then some! And then lots more too! It truly is a great tool to add! Please ask your developers to consider this addition to the app ASAP please! Please please please! With a cherry on top if that’ll help the bribery factor out? Overall it’s a great app and I just wanna have to like it even more if that’s possible! I’m hoping that it IS! Cross Stitching app of all time! I appreciate your time! Thanks again! I have only been working with cross stitch a few days and I can hardly put it down. I used to do cross stitch all the time. I can no longer see to thread a needle, even with a needle threader. Cross Stitch has given me back a love for a hobby I didn’t think I would ever be able to get back only better. The app won’t let me continue to work. It will open to get me back to what I am doing but freezes up from there. This problem started last night. I hope it gets fixed soon, I really don’t want to delete it. I enjoy it to much!!! Hello! Thank you for the feedback! We are aware of this problem and working on this. It will be fixed with the next update. Please stay tuned and sorry for the inconvenience! Ex: A = (random blue)ququ1276 <— this isn’t a color but you get the idea, hopefully. I hope you use my suggestion because I like stitching in real life too! Hello! Thanks for the feedback and a suggestion, we will discuss it with our team and possibly implement in the future, so stay tuned for updates. Thanks for the patience and have a good day!